In over 4000 films, Hollywood has shaped the image of Native Americans. Classic Westerns like They Died With Rheir Boots On created stereotypes. Later blockbusters like Little Big Man, One Flew Over the Cuckoos nest and Dances with Wolves began to dispel them,. Not until a renaissance in Native American cinema did films lke Once Were Warriors and Smoke Signals portray Native people as human beings. The movie is the work of Neil Diamond, a Canadian member of the Cree Nation. He examines the myths and fantasies that have developed in the American psyche because of the influence of Hollywood films. Russell Means talks about Crazy Horse, whose name, he says, really mean 'His Horses had Spirit'. Diamond shows how the descendants of Crazy Horse and Red Cloud are living now, on the reservation. The early silent films had many films about Indians. Jim Jarmusch talks about how the Western was a very pure, open form where you could write or say all kinds of things. I agree, and I wish the documentary explored this topic more fully. What were some of the more popular movies trying to say? In the silent era Indians were often portrayed in a positive light, and had Native directors and actors. The film talks about how in real life all Indians were great riders, but in real life most Indians can't even ride. At this point in the film I begin to understand one of the main themes the film is focusing on. It is the myths that were created in films, that people still believe about Indians today. The film is trying to show that Indians today aren't more noble, more spiritual or more savage than other people. They are just people, trying to make it with this gigantic myth formed in the movies hanging over their head. The film describes The Silent Enemy (1930) as an authentic film using Native actors. It is attempt to capture the life style of a 'vanishing people'. The star of the movie was Chief Buffalo Child Long Lance who played a mystical warrior. But in real life he was actually Native, black and white and was eventually shunned because of this and later committed suicide. The film then talks about how in the 1950's the Indian was transformed on film in to a brutal savage. A clip from The Plainsman (1936) where Gary Cooper, playing Wild Bill Hickcok, is raised over a fire to be burned as thr Indians dance around him. In the Depression the audiences needed a new kind of hero. I think Mr. Wente is exaggerating the portrayal of Native Americans and the influence of that portrayal in Stagecoach. Stagecoach was and is a wonderful movie. It's true that the Natives were used as forces of nature threatening the stagecoach as it crosses the plains, but it is for the people inside of the stagecoach that John Ford has set his sites in this film. It is inside the stagecoach, inside of white society, where Ford finds the hypocrites and phonies. The Indians were attacking the stagecoach, which was probably illegally crossing their tribal lands, and they were being massacred for their trouble: it was arrows against rifles. The Indians played a very minor role in this great film, and certainly were not the target of it. The movie is certainly iconic in the great scenes of the Indians attacking the stagecoach, but I don't think these scenes reflected badly on Natives in general. In Ford's Drums Along the Mohawk, made the same year, we do see Indians portrayed as drunks, and blood thirsty savages. But Ford was later a leader in a positive portrayal of Natives (you can read about this issue in John Ford and the Indians). The film then shows some of the big white stars who have played native roles : Burt Lancaster, Anthony Quinn, Charles Bronson, Elvis, Victor Mature, Chuck Connors, Burt Reynolds, Boris Karloff, and Sal Mineo bit it really doesn't discuss any of the roles. The movie also talks about how all the Indians were dressed in feathers like Plain Indians regardless of what tribe they were supposed to belong to. I totally disagree with the view of The Searchers portraying Ethan as a heroic figure. John Ford showed Ethan Edwards to be a homicidal, racist maniac who was willing to kill his own niece because she had, through no fault of her own, been defiled by the Indians. It was Martin, who was one eighth Cherokee, who Ford uses to show Ethan the error of his ways. It is Martin who is the hero of The Searchers, and it is he who is showing American audiences in 1957 America that there should be no place in their house for racism. At the end of the movie Debbie and Martin are welcomed in to the house and in to the American family, while Nathan turns and walks away. Ford was pointing out that there is no place in the American home for the kind of racist feeling that Ethan had. I think Jesse Wente totally missed the point of the movie. The movie then has a really funny scene from A Distant Trumpet(1964) that shows how the Navajos actors ad-libbed their own lines into the dialogue, but no one knew, since it was in Navajo. Then we see Bugs Bunny killing Indians. Neil Diamond then shows the massacre scene from Little Big Man (1970) to children on a Crow reservation. The children watch in what seems to be a mixture of sadness and shock. The movie then discusses how in the 1960's Native Americans were made to stand in as an allegorical tool to stand in for any oppressed peoples. Natives stood in for explorations of the civil rights movement. The movie also goes in to the whole AIM movement. Billy Jack stands up for his people. The AIM movement has a standoff with the federal government at Wounded Knee and then Marlon Brando has Sacheen Little Feather talk about the plight of the Indians in the movies and in real life. In Little Big Man (1970) stereotypes start to erode and Chief Dan George gives a great performance. 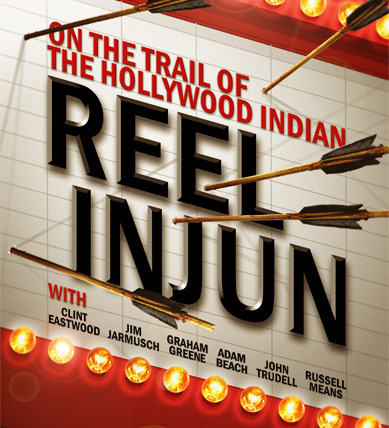 Reel Injuns then discusses Outlaw Josey Wales (1976) as being a great Indian movie? I love that movie, but I'm not really buying in to it being a great representation of Native Americans. Chief Dan George does have a great comedic role, but the movie really doesn't have too much to do with Native Americans. Then in the 1990's there was Dances with Wolves (1990). Winning Best Picture at the Oscars, it showed the Natives as complete people. But as Reel Injuns does point out, the film is flawed because even though it is supposed to be a movie about Native Americans, and is sympathetic towards them, it is really just a movie about a white guy's adventure with the Indians. Russell Means was understandably indignant that the movie had "Lawrence of the Plains" teaching the Lakota how to fight. Then came Last of the Mohicans and Black Robe, Grey Owl and Dead Man. Then a bunch of movies portraying modern day Native conditions emerge. In 2001 Atanarjuat (The Fast Runner) came out. Based on an Inuit folk tale, it is probably the most realistic Native American movie ever made. I liked the documentary, but it tried to do too many things. It showed the classical movies, the new movies, the legacy of Crazy Horse, an Indian comedian (who wasn't too funny), the adaption of Indian styles by hippies in the 1970's, Iron Eyes Cody, Sacheen Little Feather, Billy Jack, AIM, One Flew Over the Cuckoo's Nest and how the American Indians are living today. There wasn't as much discussion about the classical films as I would have liked to have seen. How can you talk about Hollywood's portrayal of Indians and not talk about The Last of the Mohicans, or Run of the Arrow or Black Robe or The New World or Ulzana's Raid .. But, overall, it was still a good film and well worth seeing.